As a long timer reader of Gunnerkrigg Court comic, I wanted to present a fanart piece that the author, Tom Siddell, can personally enjoy and to demonstrate how inspiring and, ya know, unique story he shared with millions. I ain't counting and I don't think they are either. From me to you guys, and also with all your advice from the rough draft, it wouldn't be so complete! Ive been finding copies with my signature removed on various wallpaper websites, and this upsets me that there's folks out there that don't want to give artist their credit. I saw this piece without cred given on IG. It was amazing so I had to hunt you down. Great work. Love this one. How gorgeous, I love all the little details in the forest! It really makes the scene come to life! Am i the bark? or does the bark, bark me? Great picture btw! Absolutely stunning! awesome symbiosis of 3 elements congrats Viant-t! That sounds chill, so what's the comic about? 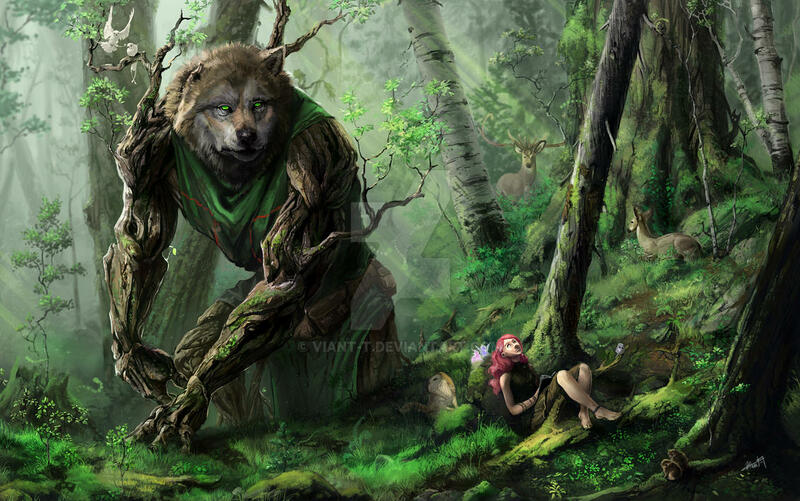 So beautiful and mysterious and that tree-wolf...Amazing! Great forest and fantasy scene! Amazing piece. Great work with the background. I can almost feel the lustrous greenery. Dude have you even READ Gunnerkrigg Court? Comparing this to Twilight is just profane! Shia Labeouf? You don't know the "just do it" meme? Fantastic piece from one of my favorite comics. I actually searched for your profile because I saw this (uncredited) on one of those quiz pages people are always linking on FB, and I wanted to know who made it. This is beautiful. And it's about Gunnerkrigg Court, which makes it even better. Wonderful work, it's very inspiring. this is truly inspired! what an amazing piece of fan art you've captured from an incredible story! This is literally so amazing I am sitting here staring at it wondering how to articulate how amazing I think it is. This great picture made me look up the comic which I now ADORE, thanks!!! I don't know anything about the comic, but this is an amazing piece of art! Stunning! This is incredible, I could look at it forever! hey I read that comic! awesome! woah... the detail is making me dizzy its awesome! Recognized Ysengrin instantly. I love the details in this piece! I used to read that comic years ago -w- It was great. I love this.